Higher Education Commission Pakistan HEC Jobs 2018. 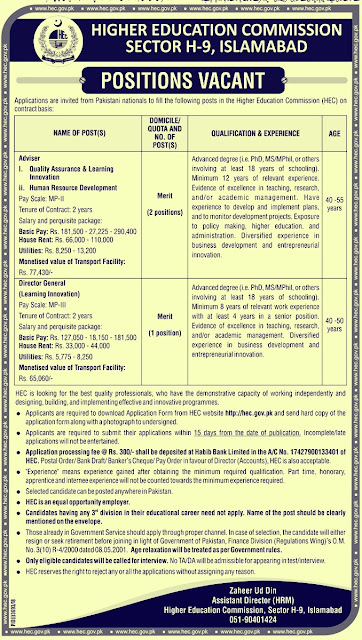 New jobs have been announced again by the Higher Education Commission in Islamabad. The application is invited from Pakistani national to fill the following posts in the higher education commission (HEC) on the contract basis. Advanced degree Ph.D., MS, MPhil or others involving at least 18 years of schooling minimum 12 years of relevant experience. Evidence of excellence in teaching research and or academic management. Have the experience to develop and implement plans, and to monitor development projects. Exposure to policy making, higher education, and administration. How to Apply for HEC job 2019? Applicants can download the application form from the HEC website. The application can be sent along with photographs to the Higher Education Commission, Sector H-9, Islamabad.